Organic agriculture can be a high yielding farming system when a scientific approach is adopted whereby the natural resources are efficiently utilized by appropriate technologies. By merely substituting the NPK with bio-inputs will not result in high yields, rather would add on to the cost of production. To a large extent farmers are being advised to replace Urea or Nitrogenous fertilizers with compost or biofertilizers and other inputs available in the market. This type of substitution farming does not work and largely results in yield reduction rather than enhancing the yields. Like the human body, farm is also a system or an organism which means, many factors contribute to the quality and quantity of the produce a plant can provide. It starts with seeds. I have seen through my experience that “Seed is the function of yield”. When good seeds are used, crops yields high naturally. Farmers should not be dependent on the seeds; there are simple methods to produce open pollinated or heirloom seeds having the desired traits which have been perpetuated for generations. Such open pollinated or heirloom or traditional seeds serve as insurance during adverse climatic condition and also reduces the cost of production. Seeds are not just planting materials. They are the signatures of the rich biodiversity, manifesting traditions, culture and heritage. It links to the gastronomy and the culinary culture of our ancestors. For me seeds are more like ‘living fossils’. It’s sad that the farmers are losing the tradition of seed conservation and sharing. It is quite evident when we visit the market often find one variety of vegetables;it can be juiceless tomatoes or tasteless cucumbers and many unpalatable veggies. 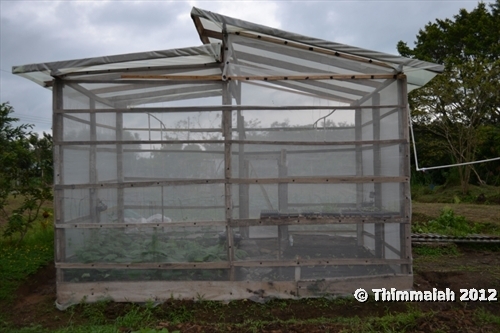 It is because of monoculture of one variety of tomato or cucumbers or a particular crop by using hybrid seeds. Hybrid seeds have destroyed the genetic diversity. Such practices have direct impact unfortunately on the culinary traditions. Many traditional food preparations are vanishing quickly along with the seeds. Thanks to some organizations like ‘Slow Food” and NGO’s who are constantly emphasising on the importance of gastronomy on human health, welfare and ecology. On the other hand the picture of present farming and food is quite gloomy. One needs to be very careful of the food one is consuming. The souce of food, how it is produced and processed, need to be understood. A variety of synthetic chemicals are used to enhance the physical appearance of food to give a 'cosmetic touch'. At the same time there is a big lobby of organizations who are the staunch supporters of technologies that support hybrid seeds, synthetic chemical fertilizers, pesticides and GMO’s. For them the “Modern Agriculture” which uses the concoctions of toxic chemicals is the saviour of humankind. Media, research organizations and some development agencies also join their bandwagon. The most common argument is that organic farming systems are low-yielding and may be a threat to the food security. They would also question, How to feed the growing population and address malnutrition? It’s interesting to see how tactfully these organizations package the problems of agriculture to market their programs, projects and products. 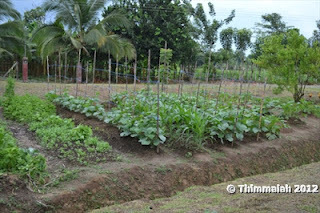 The purpose of my blog is to create awareness and confidence amongst the organizations and farmers who are adopting organic farming practices that, there are innumerable examples across the world which proves that sustainable farming approaches is the solution to the problems of the world concerning food and nutrition. 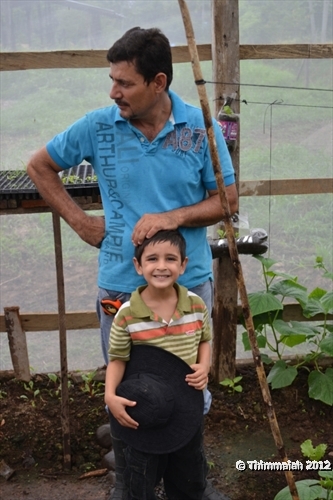 With some basic training on low-cost organic technologies farmers can increase their yields. Let me share some examples from my activities in Costa Rica. During 2010, I organized few workshops in Costa Rica on an invitation from INTA (National Institute for Technology transfer in Agriculture), Ministry of Agriculture, Government of Costa Rica. The coordinator of INTA Ms. Laura Ramirez and their consultant Mr.Leonardo are keen to promote these technologies to the farmers and farmers organizations in Costa Rica. Many farmers benefitted from my workshops and the subsequent follow-up programs by INTA. The farmer whom I have chosen for this blog is Mr. Miguel Navarro and his wife Ms. Sandra, a family with two young children. They have a small farm about 4 hectares wherein they have dairy cows, piggery, poultry and grow a variety of vegetables. It’s interesting to visit their farm which is a research laboratory by itself. There is nothing called as wastes, every plant residues and animal wastes are recycled back to the soil by adopting low-cost organic agriculture technologies. The animal dung is pumped into a biogas plant for generation of energy which is used for cooking. The slurry which is generated during the process is composted by adopting the composting method which was taught in my workshops. 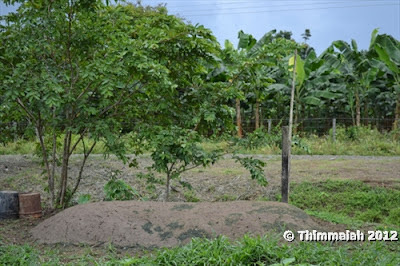 They call it “Tim Compost” and with humour also refer it as Tim’s Tomb ('Tomba Tim' in Spanish).Looks like the Costa Rican farmers (tico’s !) have already buried me alive in their farms !! Tim compost doesn’t require turning unlike other composting methods. It is based on the principle “fill it, shut it and forget it “. Farmers find it as a more convenient method to adopt, as it doesn’t require additional labour for regular turning and maintenance. Moreover there are no nutrient losses from the compost heap. 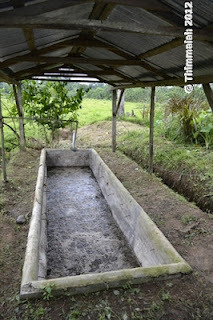 Compost is used for cultivating a variety of vegetables which are being consumed by the family and also marketed in the local market. Similarly the cattle urine, weeds in the farm which the farmers usually don’t use, Miguel uses them to make a variety of growth promoters, bio-pesticides which help to increase the yield of crops and manage the pests and diseases. I am happy that my workshops have made them to understand the importance of cattle urine and its usage in agriculture. 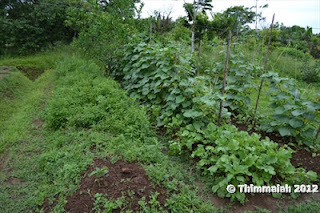 Miguel also has a polyhouse wherein he cultivates different high value vegetables which are to a large extent ‘cash crops’.Polyculture or cultivation of crops in polyhouse is very important in areas which have extreme weather conditions like excess rainfall or severe winter wherein crops cannot be cultivated. Local materials like bamboo or wood can be used for making polyhouses. The other example is Mrs. Neilly from Altimira in Costa Rica who has a coffee farm. She grows vegetables for her home consumption and her husband Mr. Oliver is an avid coffee farmer. I was astonished to see the big sized juicy tomatoes which were weighing about 500 grams each. She says that she harvests about 30 kilograms of tomatoes from each plant. She applies vermicompost (compost prepared by using earth worms) and nothing else. 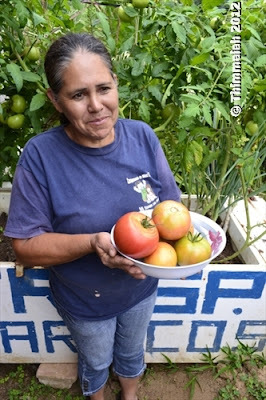 The seeds are the local seeds which she can produce and use for next crop. Likewise there are many successful examples world over on the high yielding organic farming systems which are resource conserving and climate smart approaches. Farmers can follow the basic concepts of Biodynamic agriculture, Natural Farming, Permaculture or even traditional agriculture systems. The common thread that ties these farming systems is understanding the multifunctional roles of the ecosystem. Agriculture from a holistic view, not only produces food but also provides a sequel of environmental services. In the days to come "Family Agriculture" would play a very important role. Food can be produced in every house.Those who have access to land or not they can cultivate crops. People who are staying in the urban areas can also grow food in pots and artificial media. I will try to share simple techniques of food production in my future blogs. Till then eat safe food and be consious of your food choices.